Samoans make two kinds of pancakes - flat round ones and round round ones. Both recipes are so simple that they are unwritten and measured by the eye. Both use ingredients that are probably already in your pantry, and both can be mixed and ready to eat within half an hour. My favourite are the panikeke lapotopoto - the round round ones - which commonly come in two flavours: plain and banana. Though I've also had them with pineapple and even raisins too. Now, you shouldn't think that panikeke are exclusively Samoan, because Tongans make them, as well as Fijians. Heck, even the Okinawans have something similar. Interestingly, some people squeeze the dough out from their fists, a sort of human pastry bag, if you will. 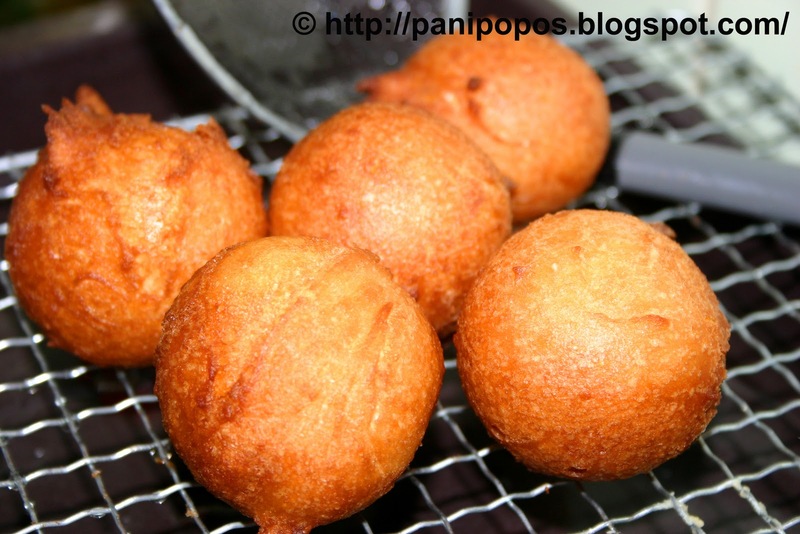 They claim that the fried product is rounder and better shaped than those that enter the frier via spoon. I reckon it's just a clever way to make sure the cook doesn't pop every third panikeke into their mouth. Think about it. If one hand is squeezing the dough in, and the other hand is taking the cooked panikeke out (with a utensil, obviously), then there are no idle hands to stuff your face with. So the following recipe makes a baker's dozen, that's 13 pieces. But don't count how many are in the photo ok? Because it's the cook's right, even their duty, to eat a panikeke or two. How else will we know if the oil is hot enough? Heat up your oil over medium heat, then as soon as it starts to get shimmery, turn the heat down low. If you have anything as fancy as a thermometre in your kitchen, heat the oil to somewhere between 320°F and 356°F (160°C to 180°C). You don't have to wait for your oil to get to temperature before mixing your batter. It'll take you less than five minutes, so go ahead and sift the flour, baking powder, sugar and salt. Add the egg and milk, then mix everything up with enough water to form a thick batter. You know, I want to call this a batter because we're making pancakes, but it's actually more like a wet dough. See the video if you're not sure what consistency it should be. Fry tablespoonfuls in the oil for 3-5 minutes until they're dark golden brown. If your oil is too high, the panikeke will be uncooked on the inside. If your oil is too low you'll have greasy panikeke. So every couple of batches, break one open to make sure it's cooked through, and eat it if you really must. Eat hot or cold, though these usually don't get a chance to cool down before they're snatched up. * You can substitute self-raising flour for the flour and baking powder. * This recipe can be, and probably should be, doubled, tripled, quadrupled. Just make sure you don’t add too much liquid. * Add a dash of vanilla to the mix if you like. * Feel free to squeeze the panikeke from your hands, but two spoons work just as well. 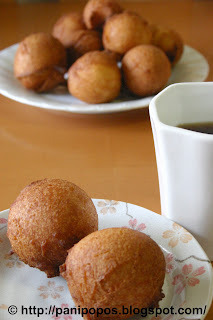 If you mixed a good dough, and the oil is the right temperature, then the panikeke will round themselves out, no matter what shape you drop in the oil. And if your panikeke have little 'horns' on them, well man, grab those horns! They´re crunchy and delicious! Oh, these are divine! I have missed them, and I am so excited to try making them myself. Thank you for sharing all your delicious recipes with us! No worries Jenn. I enjoy making and eating everything on this blog. Glad to hear your feedback, thx!...don't know who decided that panikeke have to be round...they taste good whatever (animal) shape they are. Thank you so much for the demo on Samoan Panikeke. Finally a great recipe to follow, no more guess work. I appreciate the background information on how the panikeke will naturally fill it's self out to become round. Keep up the great website, it's awesome heck, your awesome!!! Awww...shucks...making me blush. Thx for the compliments. I want to make banana flavored ones, but Im not sure how many bananas to add. I'm thinking 2?? For the quantity of batter up above, add 1 very ripe banana. Awesome! Thank you for this awesome blog! My panikeke came out pretty good, but I know my next batch will be even better. Hi Jen! Thx for dropping by the blog and for trying my recipes...I'm always happy to hear if something works or doesn't work for you...I don't have recipes posted anywhere else except for this blog (videos are hosted by YouTube)...All the best with your cooking! LOL...Matagi, you'd be surprised what I've eaten from this blog for dinner, and breakfast...I totally understand! Thx for dropping by! So awesome to read your comment...gave me the warm fuzzies inside...I'm so happy that the blog helps more people make yummy Samoan desserts, because honestly, I don't think island food gets the recognition it deserves...Happy cooking! How do you do the pineapple ones? 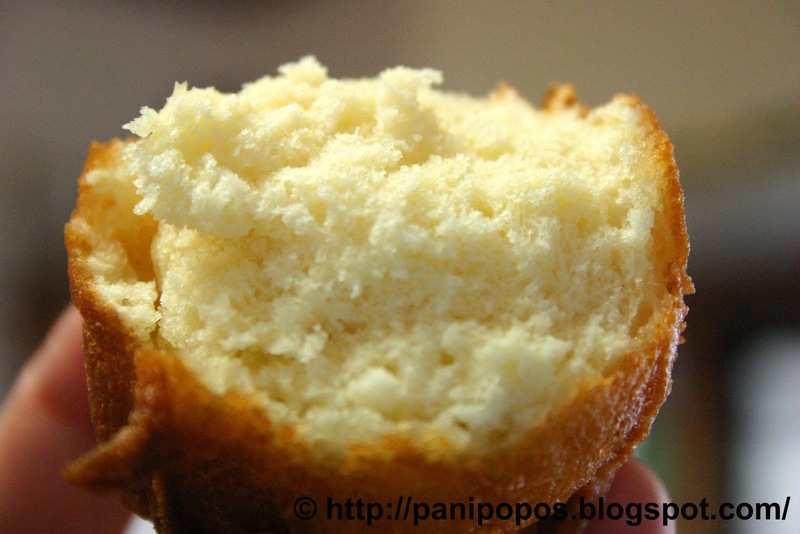 I am also looking for a German bun recipe with the shredded coconut center that is deep fried. That seems like a heavily guarded secret. Thanks for putting up some great information & videos. I'll try to make a recipe for pineapple and banana ones soon...Cheers! Thanks a lot for the comment! Dubai huh? Exotic location! Everyone makes the buns a little different but this recipe works for me and my family...Hope it also works for yours...Happy baking! Vanilla essence is a great idea, and I love it when I hear about variations to the stuff I make...Anyway, I'm really happy my blog is useful to someone, and I haven't been doing all this work for nothing. All the best with your cooking! It's my pleasure to share what I know...Sometimes it's easier to buy panikeke if you only want to eat one or two, but if you want enough for your family after dinner, then definitely make them at home...good luck! Thanks for your recipe! I tried this last night and it worked out really well : ) The whole family enjoyed them and my parents were so impressed they said I should set up a panikeke stall at the market LOL... Well, that has to be the ultimate compliment from them. I would like to try some with banana and/or pineapple - look forward to your next recipe for panikeke and thanks for this blog. Hi Studymum, thanks for trying out the recipe...I want to make a recipe for the banana and pineapple ones but haven't had the chance yet...Maybe in a month or two...Thank you for the feedback, much appreciated! These are a hit with my afakasi kids! Thank you! Mmmmmm. Hi Amanda, thank you very much for your comment...I'm sure you did your mum proud by making panikeke and getting them right the first time...You're a legend in the making! Thank you very much. I tried cooking these for my in-laws that came from samoa and it did not come out well. Mine look like little animals!! So I gave up on making them, but after seeing your easy instructions and the actual temp your oil should be it makes me want to try it out now!! Super excited and wish me luck. Thanks so much for your easy and help instructions. Much alofas and keep up the great work!! Good luck and please don't give up...Even if they're funny shapes they probably still taste good! Thank you! This is me again about my animal looking panikeke. Lol. I forgot to post my name from June 25th, but guess what? I tried it and I did it!! They don't look as perfect as yours, but after the 7th or the 8th one they were roundish, nice brown colored and not greasy! It was so good! My little one loves it when his grandma makes them and now his mother can too!! Thanks for wishing me luck and God Bless on keeping the Samoan food tradition alive! WOW Grace! Thanks for the feedback...I hope your little one likes them so much he continues the tradition started by your mother...Just remember though, as my mother used to say, if you eat too many panikeke, you start to look like one...(and I looked like one all through my childhood...lol)...All the best! THANK YOU FOR SHARING THIS! I haven't had this in years and it was sooo easy to make. Now I don't have to bug my parents to make it for me anymore, lol! Thank you thank you!! Hi Jaybird, thanks for trying out the recipe. Just act like you don't know how to make them or you'll be taking over as the family fryer. Malo! Hey Fijigirl, good luck with these...They're a favourite across the islands! Love this recipe!!! My sister followed this recipe and its the bomb.com!!! Thanks for your blog! Awesome stuff! Glad you like it. Tell me how to make them so nice and round. I don't have that much oil to fill a big humongous pot. So what happens is I have to let them float on one side and turn them and they are kind of odd shaped like hair balls (but still delicious). I was thinking of making a special panikeke pot. It would be about the size of a coffee can. You know. Narrow and deep so I don't have to use so much oil. Hi Justin, you just reminded me of our panikeke oil pot....I remember that it was a permanent fixture in our house, a heavy pot kept in a cool, dark cupboard and only brought out for panikeke frying...Actually it was filled with lard, not oil, and we used it numerous times until it got dark and dirty...sounds gross, but the panikeke it produced were always tasty...If you eat panikeke a lot, by all means make a special pot, but if you don't deep fry that often (I don't) just buy the oil you need for that batch, strain it once cooled, then recycle it for your regular cooking. Good luck! It brings me to tears to finally know how to cook the Samoan food from childhood. We were raised up on restaurant & Mcdonalds. Our mom would always take us to other families house to eat samoan food and we were never taught because the kids were kicked out until we had to serve the food. I am sooo greatful & proud to be able to share our cultural foods with my own family. Thank You & may God continue to Bless your efforts. - San Bernardino, Ca. Hello, and thank you. I'm really happy you discovered the blog, and even happier that you are willing to make Samoan food...The more people that can make it, the better. Please teach any young people in your family how to enjoy and appreciate our wonderful traditional food because it's more nutritious, fulfilling and meaningful than any fast food (except Pinati's! lol). Fa'afetai! Thx for the comment...really happy you found the blog...hardest thing about Samoan food is just finding the ingredients...the rest is a piece of cake...Happy cooking! I loved this as a child! My grandma (who has passed on) used to make keke w/ hot chocolate. I'm excited to make it for my family, they will be pleasantly surprised. Hope they come out just as you remember them. Good luck! Hi, in Samoan culture, 'knowledge' has always been precious...I just decided to blog what I know so that the future generations, some of who are becoming more and more distant from the Samoan culture, have a reference they can use to recreate traditional food. If your family finds my blog useful, then my aim has been achieved. Thank you for visiting Panipopos' Kitchen! is any body able to give me a donut recipe...i miss the donuts..
Fa'afetai lava for making this blog and passing on your knowledge! I can't wait to try this out! No problem Tiffany. I hope they work out for you! Thanks for making these and for the feedback. Happy you all liked them. Don't be afraid of the pagi popo. The recipe is simple and there's also a video to help you along. Good luck! Im so excited about your blog!! I made these panikekes tonight and they came out just like i remembered it except my shapes were ugly. lol. But thank you for making this blog. One thing i regret the most is not learning all of this before my parents passed away when i was 14 and now im married and would love to share these recipes with my husband who is an "atunuu". Thank you!!!! your fantastic and I LOVE YOU!!! thank you so much! Thanks Anonymous (x3) for your comments. Glad you enjoy the recipes! I was trying to make them the other day like the way my mother does and so for confidence I called her in NZ and she was surprised that I didn't know how to make panikeke haha I tried it and because my boys and hubby were wondering what all the spikes were for, I decided that was my first and last attempt haha. From reading your blog, I may try again soon. Thanks for sharing! Don't give up! The spikes taste good despite how they look. Hope to hear in the future that you've had success with these. i'm an afakasi living on the US mainland away from all my Samoan dad's aiga, so i missed out on a lot of the food and whatnot because my dad wasn't much of a cook. now that it's just the two of us and money's tight, i know he's so homesick for the islands and your blog has taught me so much of the cooking all my Samoan aunties never got the chance to. i made panikeke this morning on a whim. Dad grabbed one with his coffee and disappeared. five minutes later he came back grinning like a little boy and grabbed 3 more. "These are as good as home! ", he said. thank you so much for putting a smile on the face of a man who misses his home and his aiga so much. your blog means more to me than you could ever know. now i'm trying not to cry into the rest of the batter :). Hello Moana, loved your story! I was smiling just thinking about how happy your Dad was at having a favourite childhood food..."grinning like a little boy" LOL. Thank you for visiting my blog and if you need any one-to-one help, feel free to email me. And hey, try not to cry into your food, adds too much salt :). Thanks for leaving your wonderful comment. Happy your kekepua'a sold - you've made more money than I ever have from my recipes LOL. Just found what I'm been looking for Samoan food recipes...masi,paifala n panikeke lapotopoto I gotta try it..Thank you!!!! Fa'amolemole a panipopos.my mum needs Samoa101 on pani popo.her pani popos are more like pani ma'a! She ALWAYS goes off this Samoan cook book made by the Samoan womens organisation or something and they don't explain everything needed to know. I know the cookbook. I have it, and there's something desperately wrong with the recipe in there. If its any consolation, my mother complains that my pagi don't taste like pagi Samoa...so maybe some people prefer the ma'a. Make your mother a batch of my recipe and see what she thinks. can i make it without the baking powder? If you substitute the flour for self-raising flour, then yes, you can. Or if you substitute the baking powder for yeast, but that's a whole other recipe. I'm actually making these right now as we speak lol. My cousin asked me to make some for tonight's Superbowl party. I was freaking out 'cause I hadn't made these since my grandmother first taught me as a kid years back. So here I am through the grace of Google search, and let me tell you: You are a lifesaver!!! I just barely got the first batch out, and everyone here is loving 'em! Thank you again for this amazing blog. I wish you all the best. Kk, gotta get back to cooking the next batch. Malo 'aupito and 'ofa 'atu from America. Hi Josh, Thanks so much for the comment! You need to lock the kitchen when you are making these or else they disappear faster than you can make them and all you're left with is the smell. Have an awesome Superbowl party and malo 'aupito for taking the time to write. All the best! I appreciate how you really tried to get your comment through...sorry blogger played around with it...and thanks so much! I was wondering what using bisquick is ok? I doubt it but i have to ask. I habent had thaes since i was a kid! i craved pagikeke lastweek Sunday and texted my aunt in hawaii for the recipe... evening fall and still no reply. i bet myself panipopos got it on her blog.. and yuss i was right ;*)... thanks panipopos for my panikekes.. love 'em! Thank you so much for this recipe!!! I am still trying to get them to be as round as yours! They look SO pretty! HAHA! Is there something i'm doing wrong when they don't go perfectly round? Did I add too much water? Thanks again for your amazing blog!!!! Thank you SO much for this recipe! I've made them twice now and have yet to get them as round as yours! Yours just look so pretty! HAHA! I was wondering if there is something I'm doing wrong? Do you think it's because I may have added a tad too much water and that's the reason they don't end up round? Anyway, they still taste good but, it's the OCD in me! LOL! I want them to be round, dangit! Haha! Hey sis, do I have to wait till the mix rises or no need??? Thank you so much for this recipe.. These are made in Ghasna West Africa and Ive been looking for the recipe. Yours look puuuuurfect..exactly as I remember them..Can you please give the estimate water to add? I look forward to your answer!!! Seki lava pagikeke samoa .. ia sei faakaikai. . Faafekai lava le sharing is caring. .
Oh my thank you .my dear Im am sooo happy you are a legend one thing though what oil do you use is veg oil ok... I did read the comment on the old pot that was only used for panikeke .. 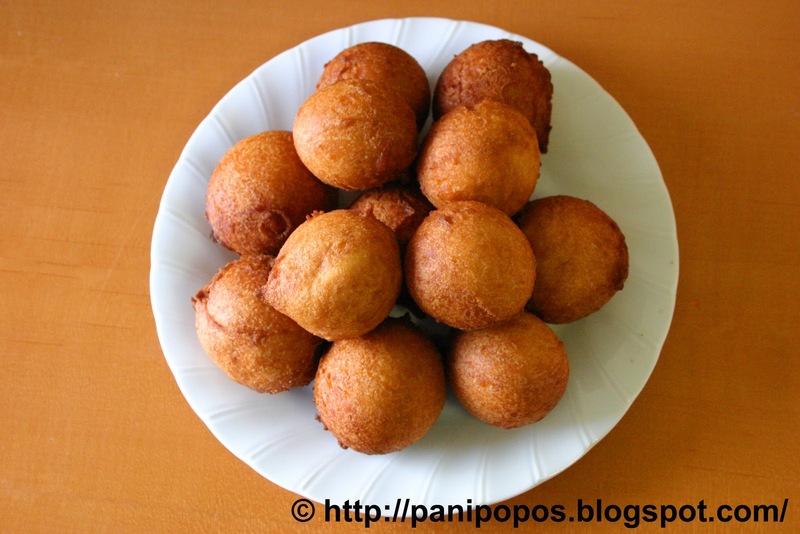 Yes my mama had one of those pots and Yes it tasted sooo goood... much aroa...<3. These are really good and remind me of andagi (Okinawan donuts). My grandma used to squeeze the dough through her fingers, but I use a small ice cream scooper since I didn't inherit her talent. My kids and I love these they can't get enough of them. Interestingly this recipe is very similar to andagi (Okinawan donuts). Even the method of making the balls. how much water should I put?